Now that spring is here, it's time to buy that winter coat at a reduced price. We picked this up in Arizona a few years ago (it gets cold in the desert) and have decided that it's time for it to have a new home. In other words, it used to fit me, now it doesn't. 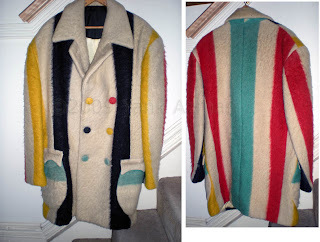 Very unusual, this blanket coat, in that the stripes are vertical; the factory made coats are all horizontal. Double breasted, fabric covered buttons, and peaked pocket flaps. 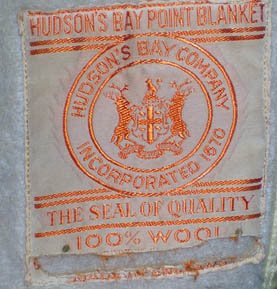 So, this was either a test production or custom made from an HBC point blanket. Size is about 38-40. Dates from the 1950s-'60s, I believe.